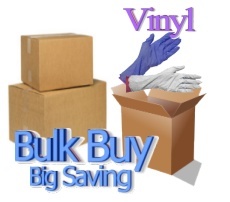 Our premium best-buy powder-free vinyl gloves are marketed to medical, dental, industrial, laboratory, food & other sectors. Our gloves have passed stringent inspection based on ISO 9001 FDA certified. Select your size and style below, small thru extra-large and powdered or powder-free. * 100% latex free minimizes the risk of latex protein and chemical residue related allergies. All colors are slightly transparent. Note: Don't be fooled by other websites that claim they have the "lowest prices" because many are selling cheap industrial (non-medical) gloves from China that do not meet or exceed ISO 9001 standards.